How can you increase the volume on your iPhone or iPad? There’s often a quick fix if you’re struggling to turn up the sound on your device. And sometimes, there’s a bigger problem with the hardware. Whether you’re listening to audiobooks and music, or concerned about missing your alarm, low volume can be a real headache. Here are some simple tips for boosting your iPhone volume. Note: High volumes can damage your ears, so take care when using the tricks below. Let’s first check through some of the basic areas that are easy to overlook. Software should be your first port of call because otherwise, there’s likely a bigger problem with your hardware. Is Your iPhone on Silent or Turned Down? Annoyed by that shutter noise when taking a photo? 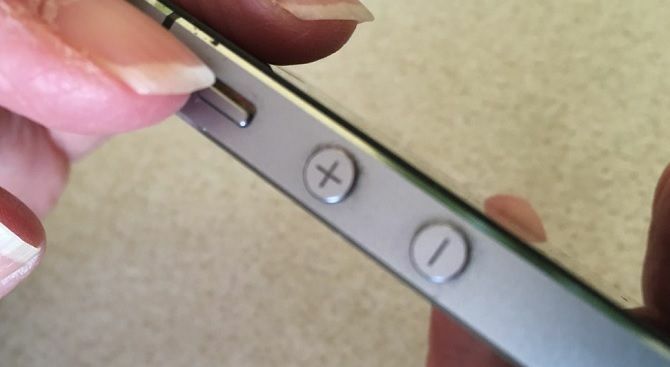 You probably set your phone to Silent by moving the little switch at the top-left of your iPhone. If it’s close to the screen, the volume is on; if it’s near the back of your device (showing orange), your phone’s muted. This shouldn’t affect music whatsoever—but it will affect your iPhone alarm volume. Just below the Silent switch, you’ll find the Volume buttons, which adjust sounds for videos and music in increments. This also works if you’re trying to increase ringer volume. If the buttons don’t change anything, go to Settings > Sounds, then check that Change with Buttons is turned on. Alternatively, you can alter the volume via the Control Center by swiping up. There’s also a mode that limits volume in accordance with EU regulations (found on iPhones everywhere). Go to Settings > Music > Volume Limit and you can set the max possible volume. 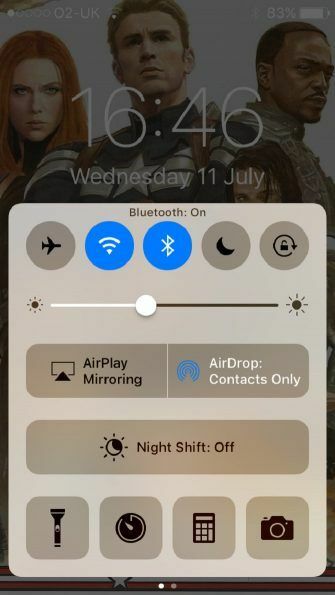 Are You Connected to Bluetooth? What if there’s no problem with your speakers at all? You might just be connected to another device. You’d likely notice if the music you’re trying to play on your iPhone is actually being sent to a Bluetooth speaker. However, you might not if you use wireless earphones like Apple’s AirPods. This could also be the case if you use an Apple TV or if you’ve connected your phone to your vehicle’s audio system. 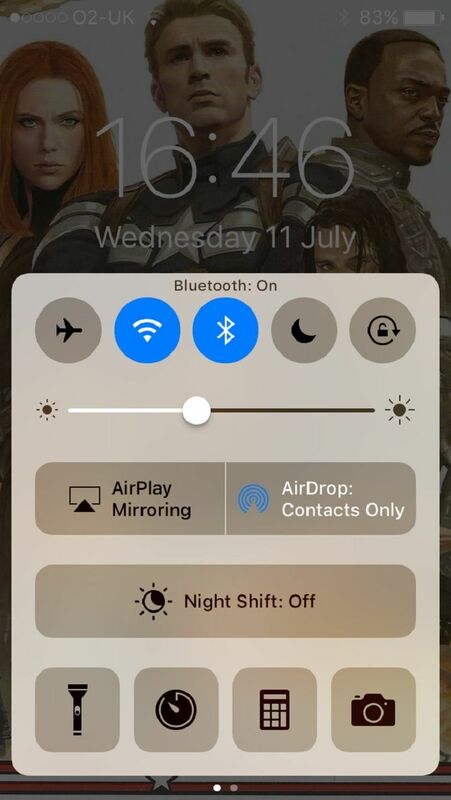 Swipe up to access your Control Center and turn off Bluetooth (or go to Settings > Bluetooth, where you can also check which devices you’re connected to). Then try playing your music or video again. The classic advice of turning your computer off and on again when an issue arises is a great way of fixing problems on your iPhone too. You need to hold down the Power and Home buttons at the same time, and keep doing so for around 10 seconds. (The combination for restarting your iPhone is slightly different on newer models). Ignore the on-screen request to slide to power off. Your phone will soon completely turn off. 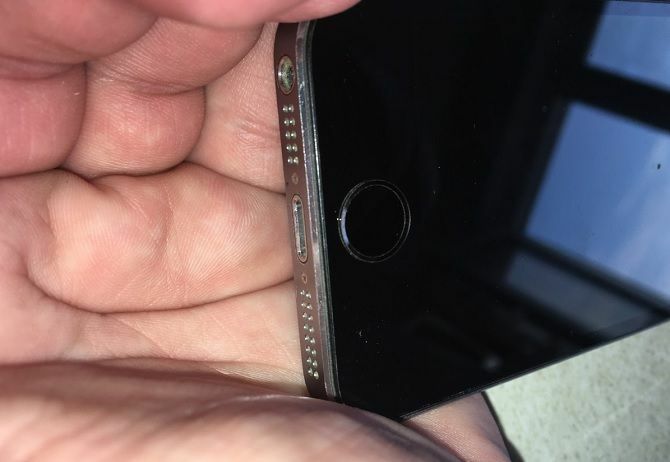 The Apple logo will appear, at which point you can release the two buttons. Your phone should continue as normal, hopefully with any problems ironed out. Don’t worry, you won’t lose any personal data. Think of this as a more thorough way of restarting your device. You might instead have an older version of iOS. This shouldn’t cause any complications in theory; nonetheless, you should try updating your phone regardless. Not only will this get patches for minor complications, but also makes sure your phone’s security is up-to-date. Don’t panic if your issue isn’t solved yet. This doesn’t always mean you have to make an appointment with Apple and get your device repaired. Sometimes, you can fix the problem yourself. We do advise great care if you’re tampering with your smartphone in any way. Don’t take your device apart if you don’t know what you’re doing. But if you’re lucky, you won’t need to anyway. Have You Got a Loose Connection? This sounds like a major issue, and yes, it can be. Fortunately, in some circumstances, it’s incredibly easy to set right. Just apply a bit of pressure to the bottom right-hand corner of your phone. 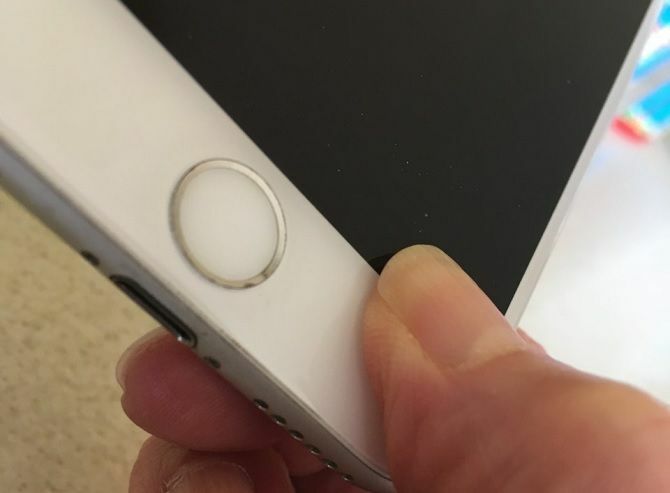 Simply put your thumb to the right of the Home button, with your index finger in the same position on the back, and gently squeeze. You’ll need to maintain this for about 20 seconds, and then release. If a connector is loose within your phone, this action can reposition it. You may need to take off your phone case for this to work, although it depends on its thickness. You’ll definitely need to remove a shatter-proof model, but a thinner plastic shell should be fine. A few users say that this same method worked for them by applying pressure (or merely tapping on the phone) near the Volume buttons. If you do this, however, be careful not to damage the touchscreen. Is Your Phone Stuck in Headphone Mode? This sounds like a software issue, but it’s really due to a problem with hardware, Namely, your iPhone thinks your earphones are still attached. It thus plays music through a nonexistent connection with headphones. Adjust the volume using the buttons on the side; the screen will tell you if it’s apparently being routed through headphones. 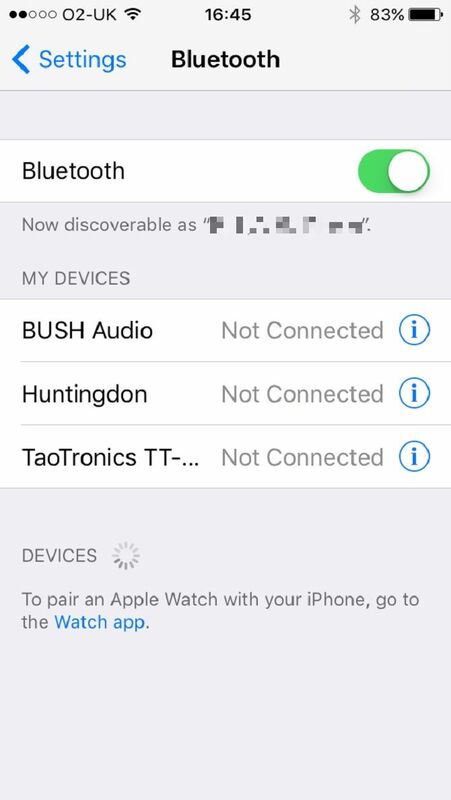 If you’re using AirPods, the Bluetooth solution above should fix it. Otherwise, grab a flashlight and shine it in the headphone jack. You might see a blockage of some sort. But since this debris can be tiny, you might still have an issue even if you don’t see anything. Firstly, try inserting your headphones then removing them. Do this a few times and test the volume again. It could dislodge anything inside the jack. If you have an air compressor, it’s an ideal tool for blowing out any dust that’s collected inside. 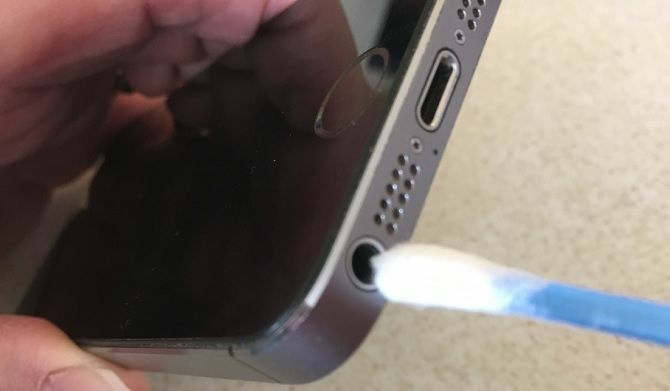 This is the safest way to remove dirt from your iPhone. Afterwards, use a dry Q-Tip, cotton ball, or toothbrush to lightly rub around the edge of the small recess. Alternatively, you can apply some rubbing alcohol to the cotton beforehand. However, you should definitely avoid other liquids as these can cause further damage. Some recommend using an ink cartridge to poke debris from the jack, but this should really be your last resort. Even small amounts of sweat can trick your phone into thinking headphones are connected. Sadly, if these tricks don’t help—and you’re not experienced enough to deconstruct your device—you’ll need to visit Apple for professional help. Perhaps there’s nothing wrong with your phone at all. Some users just want their music and alarms as loud as possible. This mainly works for music, but there’s a chance you’ll notice videos affected as well. Head to Settings > Music > EQ. This is Off by default, but you can use it to accentuate certain sounds when listening to songs. Switch it to Late Night. The mode compresses Dynamic Range, essentially inverting audio so that loud noises are reduced and quieter tones amplified. The difference isn’t massive, and will depend on the tracks you’re listening to. It can also cause some music to sound somewhat distorted. Nonetheless, users often hear a boost in volume, particularly when listening through earphones. Increasing volume isn’t always about tech. It can also involve where you place your device to amplify vibrations. Propping it upside-down, so the speakers face upwards, can improve effectiveness. Cupping your hand around them can do the same—after all, that’s basically how our ears work! Similarly, placing your phone on a conducive surface can help. Noise will reach further when the vibrations can travel through wood or metal, for instance. The latter will especially amplify acoustics. If nothing else works, try a third-party app to help you out. Equalizer is a good option, allowing you to customize your playlists to bring out certain elements in music. In much the same way that Late Night works, increasing the bass or vocals means you can tune into your favorite parts more easily. However, some features require payment, and it doesn’t currently work with Apple Music as developers are locked out of the company’s API. Still, it remains useful, should all else fail. If nothing else works, your next trip should be to your local Apple store. In most cases, you shouldn’t be too worried about troubles with your iPhone volume not working because they’re caused by a simple oversight. Don’t forget that if you want to boost your iPhone or iPad’s volume even further, you should invest in a speaker system. Check out some of the best Bluetooth speakers to pair with your phone.